In 1915 Albert Einstein presented the Theory of Relativity. His equations and his impressive personality brought him international fame. On 25 November 1915 Albert Einstein presented to the Prussian Academy of Sciences in Berlin his General Theory of Relativity – a revolutionary concept of gravity. The physicist rhapsodized about a theory “of incomparable beauty” containing the insight that gravitation is not a force, but an astounding characteristic of space and time. In a flash of genius in 1905 the patent office clerk Albert Einstein, hitherto a figure hardly known to physics, had already published five ground-breaking works. In 1922 Einstein was awarded the Nobel Prize in Physics for his work on the nature of light, but he became famous for the Special Theory of Relativity, with which he revolutionized our conceptions of space and time. Einstein discovered that light always moves at the same speed of 300,000 kilometres per second, and that no body and no kind of information can move faster than light. As part of the Special Theory of Relativity Einstein also hit upon probably the most famous equation in history: E=mc2. According to this formula, energy (E) and mass (m) are convertible into each another. This property is the principle underlying atoms bombs and nuclear reactors, the hydrogen bomb and the energy production inside the sun and the other stars. All this lies in the unimposing equation that has changed our world. The basic idea of the General Theory of relativity aims at something else. It states that matter curves space around itself. And that other bodies such as light rays must follow these deflections. The moon orbits the earth not because lines of force bind the two bodies, but rather because they dent the surrounding space as iron balls do a stretched rubber sheet, and the moon and the earth move around each other in these troughs. This also applies to all processes on the earth: a cup that falls to the ground is obeying the curvature of space. Moreover, in purely mathematical terms, time passes more slowly in a strong field of gravity than in open space. On the earth this effect is extremely slight. According to the Relativity Theory, after 80 years a man who lives in the top floor of the Empire State Building is about one ten-thousandth of a second older than his twin brother who during the same time has lived on the ground floor. In spite of the revolutionary character of Relativity Theory, its heyday occurred only in the 1960s, when astrophysics and cosmology were celebrating ever newer successes: the confirmation of the Big Bang Theory, the discovery of neutron stars, pulsars and black holes. None of these things can be explained without the General Theory of Relativity. In the truest sense of the word Einstein created a completely new cosmos –with only a pencil and paper. Some of his theory’s consequences are so revolutionary that even he shrank from embracing them. 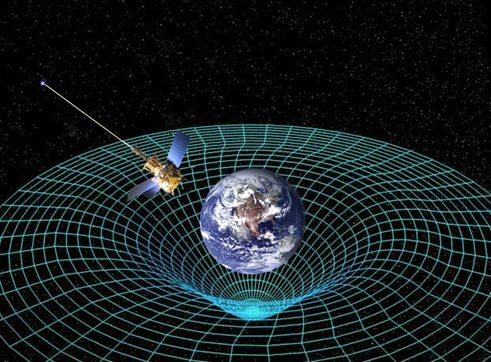 Today Relativity Theory has found its way into everyday life – namely in GPS-based navigation systems in our cars and smartphones. Einstein achieved such great recognition, however, not only because if his discoveries but also because of his impressive personality. Born on 14 March 1879 as the son of a Jewish merchant family, in his youth he already longed for a university career. This, however, was at first denied him and in 1902 he therefore took a job at a patent office in Switzerland. In 1914 he was appointed to the Prussian Academy of Sciences in Berlin, but beginning in the 1920s he found himself increasingly exposed to an anti-Semitic hate campaign. When during a stay in America he heard on 30 January 1933 that Hitler had come to power, he decided not to return to Germany. He found a new home in the United States in Princeton, where he continued his research until his death in 1955. Einstein often took positions on political developments, stood up for humanity and pacifism, and actively opposed racism – downright unheard-of conduct for a physicist of the time. No scientist has ever been as popular as Albert Einstein. Charlie Chaplin once said to him: “People applaud me because they all understand me, and they applaud you because no one understands you”. Dr. Thomas Bührke is an astrophysicist and science journalist, editor and book author based in Schwetzingen. His book “Einsteins Jahrhundertwerk” (i.e. Einstein’s Work of the Century) was published in 2015.